SHOWN BELOW ARE TWO OF OUR "SPECIAL EDITION TILES"
U.S. 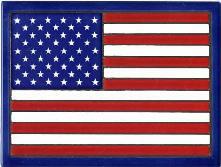 FLAG TILE 6" x 8" Special Edition $54.95 each FREE SHIPPING** BEAUTIFULLY GIFT BOXED!! BETSY ROSS FLAG 6" x 8" Special Edition $54.95 each FREE SHIPPING** BEAUTIFULLY GIFT BOXED! !